Opera Star, Joshua Conyers, Visits NBCS. May 2018. After his Carnegie Hall debut on May 26th, Joshua Conyers visited NBCS to share his story with our students. At 29 Joshua is one of the youngest opera performers to appear at this world famous venue. “Appearing at Carnegie Hall was an awesome experience. It was a dream come true. Although I was not feeling well I had to be at my best,” stated Conyers as he began his remarks to our students. 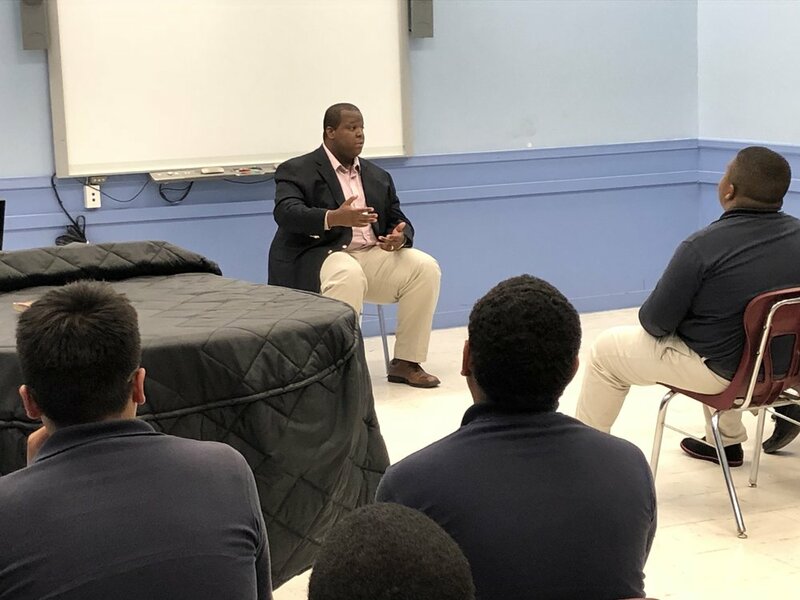 Joshua shared with our students his experiences growing up in the South Bronx and Virginia with parents and siblings who struggled to maintain themselves in an often hostile neighborhood. It was not until high school that Joshua found music as his passion. By attending the Virginia Governor’s School of the Arts he began studying music and, after attending a performance of Puccini's Turandot, opera became his passion. Growing up, Joshua characterized himself as strong athlete with little interest in academics but opera provided the inspiration for him to succeed. Our students were impressed with Joshua’s story and his rendition of Ride on King Jesus by Hall Johnson. The Concert Chorus thanked Joshua with several selections from their music book including, Think of Me ( wherever you go). Joshua has made a commitment to our school by joining the Young Professionals Advisory Board and has promised to return to NBCS and visit our students again.